The amount of cardamom in this recipe may seem like a lot, but it's balanced by the other spices. Make sure the spices you use are fresh and fragrant. Mix just until all ingredients are well blended; do not overmix. Chill dough for 3 to 4 hours before rolling. Preheat oven to 350 degrees. Roll dough out on a lightly floured counter to 1/4 inch thickness and cut with your favorite Ann Clark, Ltd. cookie cutters, then transfer cookies onto cookie sheets that have been lined with parchment paper or silicone liners. 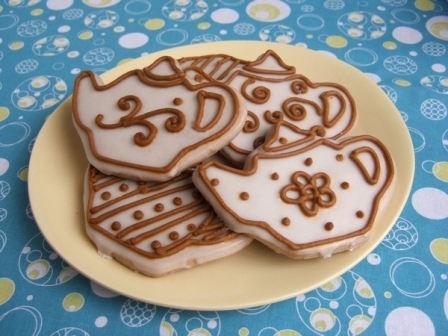 Cut decorative patterns in the cookies if desired. Using a pastry brush, brush each cookie lightly with water, then sprinkle with the cinnamon sugar mixture. Bake 10 to 12 minutes, until lightly colored. Let cookies cool slightly on cookie sheets, then transfer to a wire rack to cool completely. If desired, glaze with Tea Glaze (recipe below): Hold each cookie by its edges and dip it upside down in the glaze, then let the excess run off and place the cookie right side up on a wire rack that has been set over a cookie sheet. Let dry.